Softcover. The criminal cases described by the author take the reader on a journey into the dark scret side of Rochdale's long history. This old town, surrounded by brooding Pennine hills and wild open moorland, has been the setting for a series of horrific, bloody, sometimes bizarre incidents over the centuries. From crimes of brutal premeditation to crimes born of passion or despair, the whole range of human weakness and wickedness is represented here. There are tales of ghosts and skulduggery, forgery and betrayal, highway robbery and murder, riots and repression, public executions and instances of extraordinary domestic cruelty and malice that ended in death. 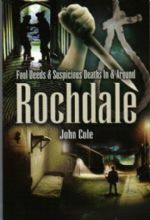 Unforgettable local cases are featured - the suicide of John Ellis, the public hangman, the booby trap that killed 2 policemen, the mummified body that prompted a pioneering forensic investigation, the author's chronicle of Rochdale's hidden history will be compelling reading for anyone who is interested in the sinister side of human nature or the social conditions that nurture it. Illus., Bibliog. and Index. 180pp. 8vo. From the library of true crime writer, Wilfred Gregg, with his personal b/plate. F.